For Mother's Day we gave our Mothers and Grandmothers a choice of an apron or this bag pattern. They all chose the bag. My Mother wanted the sock monkey fabric because she though it was so funny. It did turn out pretty cute. There is a monkey head button on the back that the loop goes over to close the bag. I had a hard time with the corners on this bag. It didn't say to clip them but I think it helps in terms of easing the curve. I didn't know what kind of interfacing to use and I didn't see any guidance in the pattern instructions either. I ended up using some fusible fleece style that gives the bag a little more stiffness. It made it a little hard to sew when joining the inside and outside bags together though. 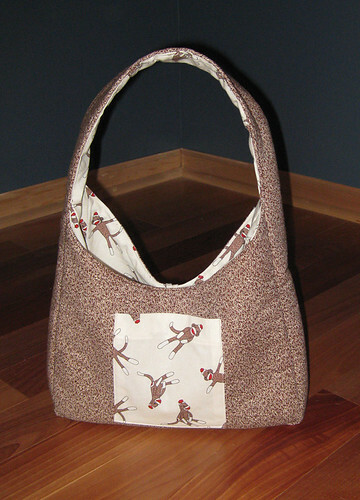 *This bag is made from Grand Revival's Flea Market Bag pattern. It is the size small shoulder bag version. The fabric is by Moda. 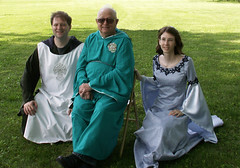 I sewed this dress from my Brother in-law's Renaissance Wedding last May. Since it was in early summer so I had to go with lightweight fabric and I chose not to line the sleeves as the pattern called for. Though it is not shown, this dress laces up the back. I learned a lot from this project considering it was my second dress and the first time I had ever done sleeves. There is lining in the top half of the dress so I got the "pleasure" (sarcasm) of doing the sleeves twice! All and all it went pretty well. My biggest issue is that my hips are one pattern size larger than my bust. So that makes for complications. I'm also 5'4" so I had to shorten my pattern which was something I'd never done before either. See the full dress here! 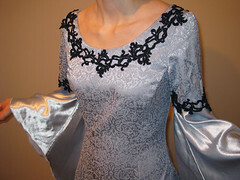 *Sewn from McCalls Costume Pattern #M4491 out of random fabric I found at Jo-Anns with crepe back satin for the sleeves.